Here it is September already! The air is feeling nippy lately with a hint of autumn to come. It reminds me of August in the mountains. Every day when I go for a walk, I notice more and more leaves on the ground. Some of the smaller trees are beginning to turn yellow and red. Mother Nature is preparing for a winter's sleep. The geese, their young ones fledged, are flocking together before the long flight South. I hear them honking overhead throughout the day and occasionally at night. All the birds are gathering. The crickets are singing louder than they have all summer. The bees are gathering nectar from the late summer flowers. The squirrels are busy harvesting nuts from the trees. For the first time, it has occurred to me that the trees here in New England have very little time in the sunshine to grow. It seems their leaves just begin to come out and turn green and then they change and fall. So little time! Or maybe I'm just getting older and the time flies by faster! I suspect that might be the case. At any rate, summer is fading and fall is fast approaching. 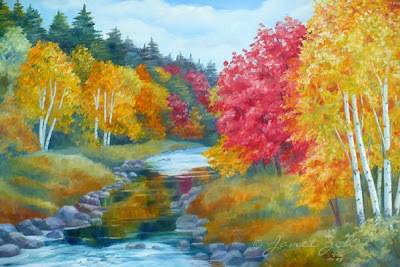 This has inspired me to begin a largish oil on canvas of autumn trees reflected in a stream. Also to list a few autumn landscape prints in my new Fine Art Prints Shop. There are only a few, so I'll need to paint more. 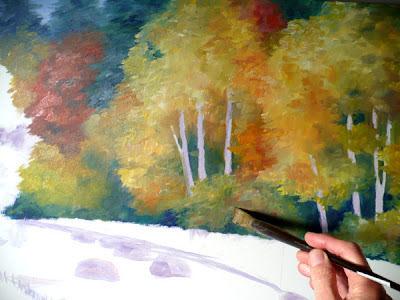 In the meanwhile, this canvas needs finishing. I'll post more about it as soon as I've made some more progress! What hints of autumn do you see where you are?